Members of Boston Handmade will be representing all over New England this weekend! Visit us at these shows and support small businesses by buying handmade! 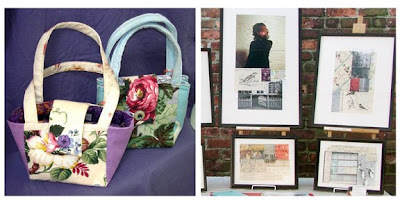 RISD Alumni Art Sales feature thousands of items designed and created by alumni from all over the country and the world. Items for sale include fine art, home accessories, greeting cards, jewelry, paintings, furniture, rugs, clothing, photographs, glass and ceramics. Boston Handmade members Linda B. Dunn and Jessica Burko will be exhibiting their work at this show! and on SUNDAY, SUNDAY, SUNDAAAAAaaaayyyyyy! The SoWa Open Market offers a shopping experience like no other in Boston - - Meet the artists, artisans, and craftspeople behind the work. The Market is fast becoming part of the South End's well-known artist's community. 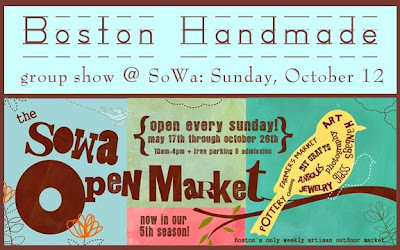 On October 12th More than 25 members of Boston Handmade will be exhibiting their work at the Sowa Open Market showing and selling handmade jewelry, clothing, accessories, house wares, art, photography, toys, and sculpture. Boston Handmade promotes local independent businesses and individuals creating one-of-a-kind and limited edition handmade works in small studio environments, not factories. We will have two live musical performances at this special event: Kelley Morris & the Fallen Free will perform from 12-2pm and Joe Rich will perform from 2-4pm. We look forward to seeing YOU at one or both of these great weekend events!!! !